Go ahead and scroll down below the video to begin learning more about the latest version of the Chevrolet Camaro. Don't stress out over your next purchase; look to the foremost Chevrolet dealer in Arlington, TX for thoroughly researched reviews written by industry specialists. Filled with practical facts and specs, each paragraph gives you full access to everything the Chevrolet Camaro has to offer. Is the Camaro right for you? Find out below! 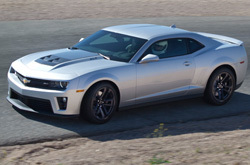 When comparing the 2013 Chevrolet Camaro against the 2013 Hyundai Genesis Coupe, Ford Mustang, Nissan 370Z and the Dodge Challenger, and you'll spot that the Camaro wins over those autos in loads aspects. Get a load of just a few of the reasons below. Your Chevrolet should be treated thoroughly - that means Chevrolet factory- trained Camaro technicians, legitimate Chevrolet parts, and the joy that comes from a 12-month service dealer warranty. 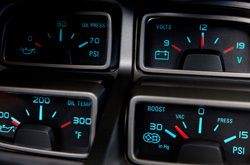 Vandergriff Chevrolet service and auto repair in Arlington, TX is a click away! Chevrolets in Arlington, TX can take a pummeling, so turn to the auto repair experts in Arlington, TX - Vandergriff Chevrolet. We can undertake a manageable task as an oil change, or deliver quality tough Chevrolet Camaro service and repairs like strut and shock repairs, timing belt replacements and Camaro transmission rebuilds. It's crystal clear: If you want experts service and budget-friendly repair prices in Arlington, TX, make Vandergriff Chevrolet your first stop for Chevrolet vehicle maintenance. Click below this paragraph to find and print the latest coupons with tremendous savings!